This article, hypothesis, and digital images are copyrighted. © 1997, 2001 by NauvooTemple.org. All rights reserved. Nobody knows exactly who burned the Mormon temple in Nauvoo, Illinois, in 1848, and motives for such a burning are usually unmentioned beyond brief allusions to arson—a fire supposedly started by persecutors remaining from a frontier mob. 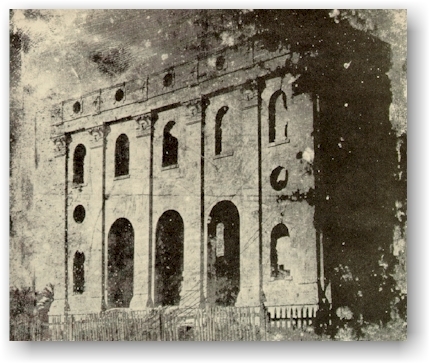 Construction of the luminous white limestone edifice began in 1841 under the direction of the religious leader Joseph Smith, at a cost of one million contemporary dollars. The place of worship was meant to be the grandest building west of Ohio, and crown the Mississippi bluff above Nauvoo—which then exceeded Chicago as the largest city in Illinois. 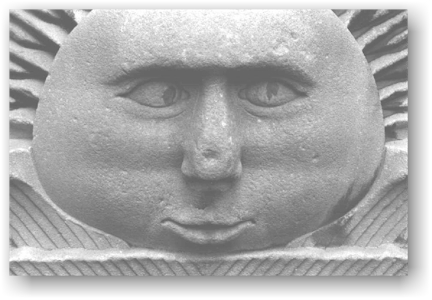 The building is so important to American history, that the Smithsonian Institution displays one of its sun-faced capital stones, carved in raised relief, next to the original flag “Old Glory.” The temple was not even close to complete when Smith was killed by enemies in 1844, and it was still unfinished though roofed when the Mormons left Nauvoo for the West in 1846, despite a hurried effort to make-do and use it anyway. (1) The fire in 1848, followed by a tornado-strength wind gust in 1850, kept the building in archaeological rubble for one hundred and fifty years. However, The Church of Jesus Christ of Latter-day Saints, headquartered in Salt Lake City, is now speedily rebuilding on the same site, anticipating completion of a replicated temple during the fall of 2001, at a cost of $23 million. The arson story began nearly fifty years after the fire, when folk history evolved that gave the credit to an antagonist of the Mormons named Joseph Agnew. But, the firing of the temple is surrounded by issues more complex than a sole arsonist’s resentment against a religious society that had already left the region and were consequently no longer a threat to the developing Illinois political scene (where men like Abraham Lincoln and Stephen A. Douglass were beginning their careers). The Mormons themselves had plenty more motivation to burn it themselves, when they departed for the Rocky Mountains, leaving their property behind in economic ruin. For three full years Brigham Young, while establishing himself in the role formerly occupied by Joseph Smith, had attempted to sell the Nauvoo temple to the Catholics. This repeatedly failed in part because he could not overcome a characteristic in its legal title that did not qualify him as the owner. 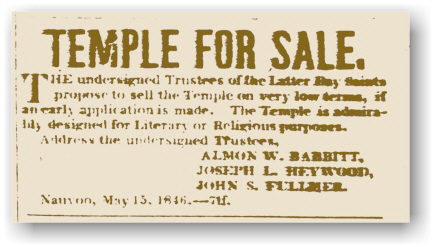 After his church was settled in Utah, in 1847, the temple east of the Mississippi had no practical use nor financial benefits—except to Young’s enemies and competitors—and he said essentially that it was too sacred for strangers to possess. This article will show that before the temple burned, Young said he hoped it burned; and after it burned, Young said he was glad it burned. Later in Utah, Young is known to have burned Mormon properties rather than surrendering them to enemies. 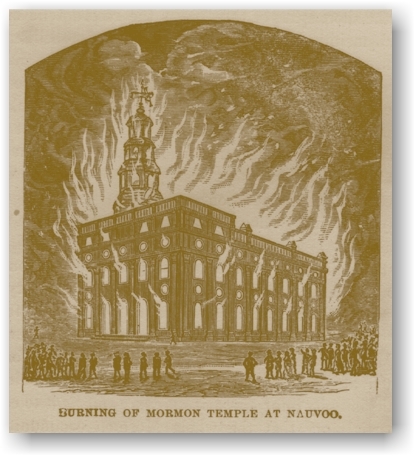 Young had a motive and means to have the Nauvoo temple torched; and made prior statements and performed subsequent acts that are consistent with someone who would ordered the temple burned behind him as he retreated. Young’s willingness to walk away from the negotiations over the issue of fire insurance is inconsistent with his lifetime stance against carrying such insurance. Later, after living in Utah nearly thirty years, he said: “I have about as many buildings as anyone in this Territory, and I never yet paid a dollar to insure one of them, or any of my property, or myself. . . . Some [Mormons] will get their buildings insured as high as possible, and then they will accidentally take fire on purpose.”(9) Young’s stance that insurance is useful only when arson is contemplated, is an early indicator that he planned to order the temple burned after his demand that it be insured. Midway through the advertising campaign, Strang published a column and a half in his own periodical reprinting documents from the Hancock County “Book of Mortgages and Bonds.” Those documents deeded the Nauvoo temple to Joseph Smith as the sole trustee for the Church of Jesus Christ of Latter Day Saints—and further required that his successor as trustee would be the First Presidency of the church. Young had not yet duplicated Strang’s claim of the formal office of First President, instead claiming the right to lead by virtue of being president of a lower body, the quorum of twelve apostles. Almon W. Babbitt and the other trustees Young had appointed therefore qualified even less as owners of the temple. Indeed, the eventual election of Young to the office of First President on 5 December 1847 may have been compelled by the quest to sell the temple. On similar legal grounds, Strang and his supporters took possession of the Mormon temple in Kirtland, Ohio. What Nauvoo was to the Mormons in the 1840s, Kirtland had been in the 1830s, and the church had built its first temple there, which is still standing. Young’s followers brought a suit against the supporters of Strang in Kirtland, but on examination of the title deeds they withdrew the suit, paid the court costs, and left the Kirtland temple in the hands of Strang. Supporters of Strang in Kirtland included Martin Harris, William Cowdery, Leonard Rich, Amos Babcock, Sylvester B. Stoddard, Hazen Aldrich, Jacob Bump, and William E. McLellin, all influential elders in early Mormon history. After McLellin started his own group in Kirtland, the Kirtland temple was lost to McLellin’s followers. On 19 June 1848, Strang took control of the Kirtland temple a second time on legal grounds. Strang obtained a writ to eject McLellin, judgment was made in Strang’s favor, and his agent was given the key. However, McLellin’s followers axed their way through a window and took forcible occupation which Strang never attempted to regain. (15) But, from the remoteness of Brigham Young in Utah, the temples in Kirtland and Nauvoo both alike appeared isolated enough for him to suppose that if his opponents had gained the Kirtland temple then they were also capable of obtaining the Nauvoo temple—unless he took action to prevent it. The person most often credited with the burning of the temple is Joseph Agnew, a repeated antagonist of the Mormons—though this does not preclude the feasibility of Brigham Young being the person who hired him. But the accounts of Agnew appear so late that they are doubtful, and he did not live in Nauvoo where the early suspect was reported to live. The most elaborate account of Agnew as an arsonist surfaced as a supposed confession printed in the Nauvoo Independent in about 1895. (44) Agnew had died twenty-five years earlier, in 1870, but a former resident of Fort Madison, Iowa, sensationally recounted what he claimed was Agnew’s death-bed confession. Agnew’s admission is supported by B. H. Roberts, who was supposedly told of Agnew’s confession earlier in 1885 by M. M. Morrill, then mayor of Nauvoo—however that account was not published until even later, in 1900. (45) A third reference, this time by Joseph Smith III, remembers Agnew as a “disreputable man,” a “drunken lout,” and a “river rat,” but his account was not dictated until 1913 and not published until 1935. Only the manuscript history of Brigham Young gives an early date for the questionable Agnew claim, from 1856, but that history is synthesized much later by other men, and probably altered after 1895. According to that history, Joseph Smith III’s step-father Lewis Bidamon is claimed to have known of Agnew’s guilt in 1856. That is contradicted by Joseph Smith III, who said that Agnew confessed “quite some time after.” Even B. H. Roberts did not mention Young knowing about Agnew, when Roberts said in 1900 that he heard about Agnew on his own. Yet, somehow, Young’s account parallels Roberts’ account with identical phrases—meaning that B. H. Roberts actually contributed to the synthesized Young account after he first learned of Agnew on his own. (46) Also, the identity of Agnew could not plausibly have been told broadly by Bidamon in Nauvoo as early as 1856, so that even Young would hear about it in Utah. Agnew’s supposed 1870 deathbed confession said that all parties had “pledged themselves to secrecy,” such that the story was not previously known. (47) So, the accounts of Agnew are credibly documented no earlier than 1895—nearly fifty years after the arson and twenty-five years after the death of Agnew. “Judge Sharp” was likely Thomas C. Sharp, the editor of the Warsaw Signal, who later became a county judge. Sharp was indicted in the killing of the Smiths, and is renowned as the leading antagonist of the Mormons in all of Illinois and Iowa. Two weeks before the assassination of the Smiths, Sharp used his periodical to urge the killings: “Let it be made with powder and ball!! !”(56) After the burning, Sharp’s Warsaw Signal acknowledged that whether the fire was an accident or not, “the body of the Anti-Mormons, of Hancock county, will have to bear the blame.”(57) Certainly Agnew, McCauley, and Sharp had the demeanor to burn the temple in the height of animosity—but that day was several years past, when the temple was burned. The information about Agnew in the accounts of the Brigham Young manuscript and B. H. Roberts duplicate the 1870 confession recorded printed in 1895. Both accounts match the confession’s statement: “The reason for our burning it was that there was continual reports in circulation that the Mormons were coming back to Nauvoo . . .”(58) The principle fault of that commonality is that there were no apparent reports in circulation at all, and certainly then not continual reports that the Mormons were returning from Utah. The Young account is supplemental in that it says that the inhabitants of Hancock County “contributed a purse” of five hundred dollars to Agnew. The Smith account substitutes that with Agnew’s supposed confession that “he was hired to fire the building,” but that he received part of his pay in advance, and later another payment was paid, but that he was never paid in full. The striking contradiction of these two statements with the 1870 confession printed in 1895, is that to collect so much money would require that Agnew’s involvement was well known, and yet he supposedly spoke of it as being secret and made no mention of money whatsoever. Further, that the payment makes no allowance for his accomplices, who fit the profile of activists rather than hired torches. Thomas C. Sharp and John McCauley could not have been the tools of Agnew, for they were wealthy and sophisticated county leaders, not followers of a drunken river man. Agnew reportedly said they “Pledged ourselves to destroy the temple if it cost our lives,” which sounds more like the personalities of the three alleged conspirators when a motive existed before the Mormons left, not after. Fifty years after the fire, and twenty-five years after the death of Agnew, he may have also just been a convenient person to blame. There are other contradictions in the supposed Agnew confession. The narrative says that the three men came each from his own city, and met five miles down river from Appanoose on the Illinois side of the river, then they “journeyed” together on horseback to within one mile of Nauvoo. However, Appanoose is only six miles from Nauvoo already, so there is no distance they could have additionally journeyed—they were already there at the mile mark without traveling any distance whatsoever, much less so great a distance that it would be called a journey. So there are inconsistencies and implausible elements in the supposed Agnew confession, at least as recorded as an action of persecution. But the physical flame lighter in the Nauvoo temple late on that October night had an identity in someone. Agnew may have been hired as the incendiary, and later elaborated his account as a hero and head of more prominent mob leaders like Thomas C. Sharp and John McCauley. Though all three participated as an antagonistic force against the Mormon religious society, they would have lost that ambition with the Mormons already gone. There was no indication in regional newspapers that the Mormons had ever considered returning to Nauvoo as Agnew claimed was the motive. 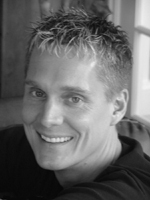 Five hundred dollars was an excessive amount of money to discreetly collect with waning interest in Mormon issues in Hancock County. However, for Brigham Young to order the temple burned, he would have needed a local intermediary to contract a hired torch, like Agnew. People who had the financial resources and regional Mormon jurisdiction to help Young included Orson Hyde, in charge of the church across the Mississippi River in Iowa. 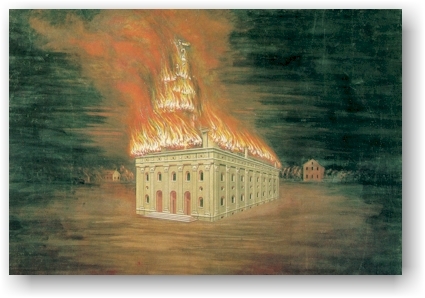 Hyde was actually accused of burning the Nauvoo temple in a remonstrance to Congress by William Smith (the only surviving brother of Joseph and Hyrum). (63) Another possibility is Almon W. Babbitt, who was the political enemy of Hyde. Babbitt was disfellowshipped by Hyde on 19 November 1848, and instantly reinstated by Brigham Young. 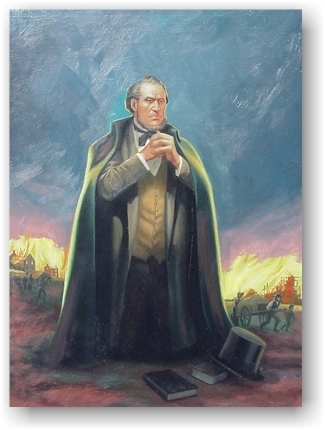 The History of the Church erroneously affixes that date of 19 November 1848 as the date of the temple fire, based on Brigham Young’s manuscript history, making an interesting inadvertent connection between the action to disfellowship and the temple fire. (64) Babbitt was so controversial as trustee of the Nauvoo real estate, that Heber C. Kimball publicly accused him of selling his Nauvoo home for seventeen hundred dollars in cash intended for emigration expenses, “but Almon W. Babbitt put it in his pocket, I suppose.” If currency was so easily obtained by Babbitt, he had the ability to pay five hundred dollars to Joseph Agnew or to any other torch bearer his superiors ordered. (65) Indeed, the opportunities were endless for Brigham Young to get the job done. Would you, if necessary, brethren, put the torch to your buildings, and lay them in ashes, and wander houseless into the mountains? I know what you would say and what you would do. All you that are willing to set fire to your property and lay it in ashes, rather than submit to their military rule and oppression, manifest it by raising your hands. 1. Autobiography of Parley P. Pratt, p. 303; Times and Seasons, January 15, 1846; Brigham Young, in the Journal of Discourses, 18:305, said it was “nearly completed before it was burned,” with some elaboration, though writers traditionally say that it was fully completed. 2. History of the Church, 7: 489-490, 508. 3. Nauvoo Temple Record, 15-16. 4. History of the Church, 7:537; Nauvoo Temple Record, 17-18. 5. Nauvoo Temple Record, 5-6, 8 December 1845; Nauvoo Temple Record, typescript, 20-21. 6. Nauvoo Temple Record, 40-46; Thomas Bullock diary, BYU Studies 31:36; History of the Church, 7: 539-541. 7. Nauvoo Temple Record, typescript, 107, 129, 130, 146, 152, 158, 179, 203; Nauvoo Temple Record, 1 January 1846. 8. Nauvoo Temple Record, 7 January 1846; History of the Church, 7:565. 9. Journal of Discourses, 17:362. 10. Voree Herald, 1 (February 1846): 8. 11. Voree Herald, 1 (April 1846): 20; and 1 (June 1846): 27; St. Louis American, 16 May 1846. 12. Quincy [Illinois]Whig, 6 May 1846. 13. Hancock [Illinois] Eagle, 10 April 1846. 14. Nauvoo [Illinois] New Citizen, 15 May to 23 December 1846. 15. Voree Herald, 1 (September 1846): 38; Gospel Herald, 3 (28 September 1848): 134-135. 16. Chronicles of Voree, 15 January 1846. 17. Burlington [Iowa] Hawkeye, 12 February 1846. 18. George Miller, “Correspondence,” 1 July 1855, Northern Islander. 19. Gospel Herald, 14 June 1849. 20. Hosea Stout diary, 9 and 31 January 1846. 21. Nauvoo Temple Record, 28 December 1845, 2 January 1846. 22. Nauvoo Temple Record, 4 January 1846. 23. Manuscript history of Brigham Young, 22 February 1846; Thomas Bullock diary, 22 February 1846; Willard Richards diary, cited in Stegner, The Gathering of Zion, 51. 24. Zion’s Reveille, 2 (22 July 1847): 76, emphasis added. 25. Voree Herald, 1 (September 1846): 38, 40. 26. Manuscript history of Brigham Young, 7 and 29 January 1847. 27. Manuscript history of Brigham Young, 3 February 1847 and 5 April 1847. 28. Warsaw [Illinois] Signal, 12 June 1847; Iowa Sentinel, 26 June 1847. 29. History of the Church, 7:434; Journal of Discourses, 24: 15-17; Wandle Mace autobiography, typescript, 207, Brigham Young University. 30. Zion’s Reveille, 2 (22 July 1847): 76. 31. Keokuk [Iowa] Register, 24 July 1847; Daily Missouri Republican, 28 July 1847; Burlington [Iowa] Hawkeye, August 5, 1847; Warsaw [Illinois] Signal, 7 August 1847; Monmouth [Illinois] Atlas, 13 August 1847. 32. Keukuk [Iowa] Register, as exchanged with Zion’s Reveille, 2 (2 September 1847): 100. 33. Keokuk [Iowa] Register, 19 October 1847. 34. Manuscript history of Brigham Young, 5 November 1847. 35. Almon W. Babbitt to Brigham Young, 31 January 1848. 36. Oquawka [Illinois] Spectator, 27 September 1848; Gospel Herald, 3 (19 October 1848): 160; 3 (26 October 1848): 163; and the Nauvoo [Illinois] Patriot, as exchanged with the Gospel Herald, 3 ( 23 November 1848): 192. 37. Manuscript history of Brigham Young, 5 November 1847; “Epistle to Saints,” 23 December 1847, Millennial Star 10 (15 March 1848): 81-88. 38. Wisconsin Standard, as exchanged with the Gospel Herald, 3 (2 November 1848): 171. 39. Warsaw [Illinois] Signal, as exchanged with the Gospel Herald, 3 (16 November 1848): 187. 40. Burlington [Iowa] Hawkeye, 12 October 1848, emphasis added. 41. Keokuk [Iowa] Register, 12 October 1848; Iowa Sentinel, 20 October 1848; emphasis added. 42. Iowa Sentinel, 20 October 1848, quoting the Iowa Statesman. 43. Davenport [Iowa] Gazette, 4 January 1849. 44. George H. Rudisill, “How the Famous Mormon Temple at Nauvoo Was Destroyed,” Nauvoo [Illinois] Independent, circa 1895-1898, typscript; Autumn Leaves, December 1905. 45. B. H. Roberts, The Rise and Fall of Nauvoo (Salt Lake City: Deseret News, 1900), 369; B. H. Roberts, Comprehensive History of the Church, 3: 22-23. 47. George H. Rudisill, “How the Famous Mormon Temple at Nauvoo Was Destroyed,” Nauvoo [Illinois] Independent, circa 1895-1898, typescript; Autumn Leaves, December 1905. 48. History of the Church, 7:530. 49. Quincy [Illinois] Whig, 20 May 1846. 50. History of the Church, 7:363, 407. 51. History of the Church, 7:145. 52. Quincy [Illinois] Whig, 20 May 1846. 53. History of the Church, 6: 529-530, 7:144. 54. George Morris autobiography, typescript, 28-29, Brigham Young University; Hosea Stout diary, typescript, 43-44, Brigham Young University; T. Edgar Lyon, BYU Studies, 18:169; Mary Lightner autobiography, Utah Genealogical and Historical Magazine, 17 (1926):205; Lyman Littlefield Reminiscences,168-169. 55. Joseph Fielding diary, BYU Studies 19:163; History of the Church, 6:8. 56. History of the Church, 7:143; Warsaw [Illinois] Signal, 12 June 1844. 57. Warsaw [Illinois] Signal, as exchanged with the Gospel Herald, 3 (16 November 1848): 187. 58. George H. Rudisill, “How the Famous Mormon Temple at Nauvoo Was Destroyed,” Nauvoo [Illinois] Independent, circa 1895-1898, typescript; Autumn Leaves, December 1905. 59. 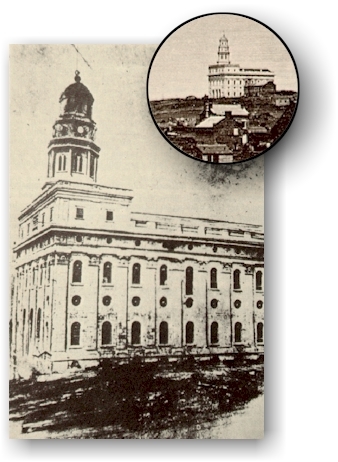 The Nauvoo Temple Record describes portraits, paintings, maps, and mirrors on the walls of the upper room (attic level), but makes no mention of any other floor being sufficiently completed for decoration. 60. Nauvoo Temple Record, typescript, 20, 86, 107. Plausibly Agnew came up Heber C. Kimball’s private staircase which climbed a single story. 61. Keokuk [Iowa] Dispatch, 12 October 1848; Burlington [Iowa] Hawkeye, 12 October 1848. Only the Joseph Smith III account describes the fire in the attic, but he evidently relied on the 1870 confession in this detail—including the motive for placing the fire in that location. 62. George Johnson, autobiography, typescript, 5, Brigham Young University; Nauvoo [Illinois] Patriot, circa week of 9 October 1848. 63. William Smith, Remonstrance to the Congress of the United States Against the Admission of Deseret into the Union . . .
64. J. Keith Melville, “Brigham Young on Politics and Priesthood,” BYU Studies, 10:488; A. Gary Anderson, “Almon W. Babbitt and the Golden Calf,” Regional Studies, Illinois; History of the Church, 7:617; Manuscript history of Brigham Young. 65. Journal of Discourses, 8:350. 66. Norton Jacob autobiography, typescript, 29, Brigham Young University. 67. Nauvoo Temple Record, typescript, 2, 137 and 155. 68. Manuscript History of Brigham Young, 9 February 1846. 69. Norton Jacob autobiography, typescript, 29, Brigham Young University; Hosea Stout diary, typescript, 45, Brigham Young University; Samuel Rogers journal, typescript, 47, Brigham Young University; Henry Bigler autobiography, typescript, 14, Brigham Young University; William Huntington journal; Thomas Bullock diary. 70. Journal of Discourses, 8: 202-203. 71. Brigham Young, “Have You Such Faith, Latter-day Saints?, Deseret News, 13 March 1861. 72. Journal of Discourses, 8: 202-203. 73. Journal of Discourses, 10:252. 74. Journal of Discourses, 19: 204-205. 75. Journal of William H. Kilgore, 29 April 1850; Lawrence G. Coates, BYU Studies, 18:432; Lawrence G. Coates; BYU Studies, 24:289; Andrew Jenson, Encyclopedic History of the Church, 367, 957; B. H. Roberts, Comprehensive History of the Church, 3:305; “General Epistle of the Twelve to the Church,” 23 December 1847 in Millennial Star, 10:84; Juvenile Instructor, 18:361. 76. B. H. Roberts, Comprehensive History of the Church, 4: 278-279. 77. Journal of Discourses, 5:232. 78. Journal of Discourses, 5:247. 79. “A Short History or the Byography of John L. Butler Partly from His Own Writing,” Historical Department, The Church of Jesus Christ of Latter-day Saints, Salt Lake City. 80. Andrew Jenson, LDS Biographical Encyclopedia, 3:4. 81. Journal of Discourses, 17:362. 82. Journal of Discourses, 5:337.